Posted by Destin Real Estate Sales on Thursday, February 23rd, 2017 at 8:26am. Ronnie LaMarque is an automotive dealership mogul who is well known in Louisiana due to his passionate theatrical support of the New Orleans Saints and the LSU Tigers. He was also the owner of Risen Star an award-winning racehorse who was the colt son of Triple Crown Winner Secretariat. 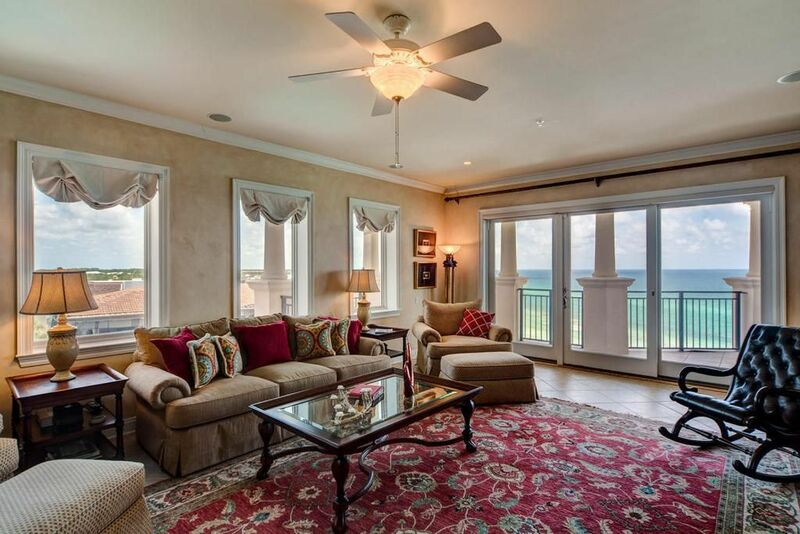 LaMarque’s primary home is in his native New Orleans but his magnificent luxurious gulf front penthouse is located in South Walton’s Blue Mountain Beach and is listed for sale. Rarely do such properties become available at the prestigious highly sought after, gated residential community of Bella Vita, (aka “Beautiful Life”). 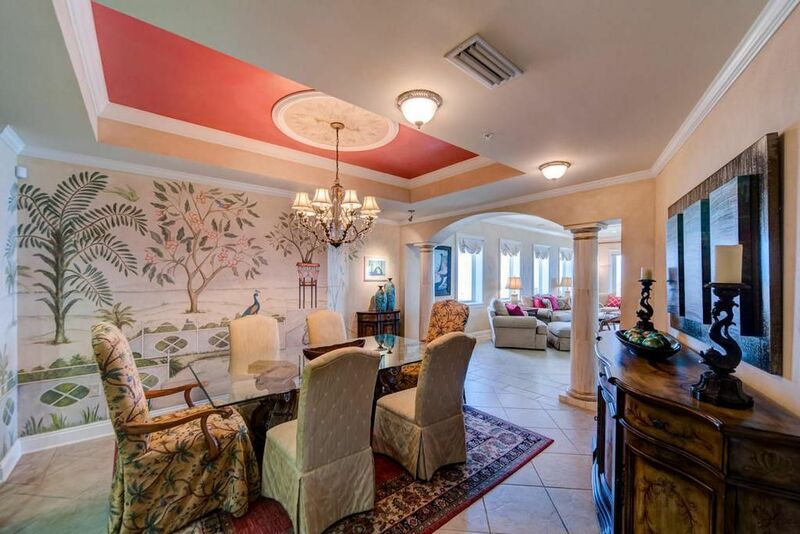 This exclusive enclave consists of only 48 regal residences on six acres of lushly landscaped grounds that is prominently perched on one of the highest points of elevation on the entire Gulf of Mexico. This complex of three residential buildings features two gulf front swimming pools, beautiful gardens, fountains, an awesome fitness center as well as a great hall where owners can gather for receptions. The gathering hall includes seating areas, a library, a reading room, a patio and kitchen. This magnificent rooftop residence features four bedrooms with luxury baths en suite and comprises over 3,000 square feet of gracious spacious living quarters. Two Master Bedroom Suites face the gulf and include gorgeous designer bathrooms. The main living area is a Great Room that incorporates the living room, formal dining room and an open Gourmet Kitchen. Double columns serve as portals providing majestic entry points from room to room. This entire penthouse comes beautifully furnished with upscale designer accents, classic antique reproductions, decorative art and paintings. It has never been on a rental program but only occasionally used as a private privileged vacation residence. The wonderfully unique ambiance seamlessly blends elegance with comfort. Multiple windows and glass doors provide plenty of light and direct access to a wide columned covered veranda that spans the entire width. 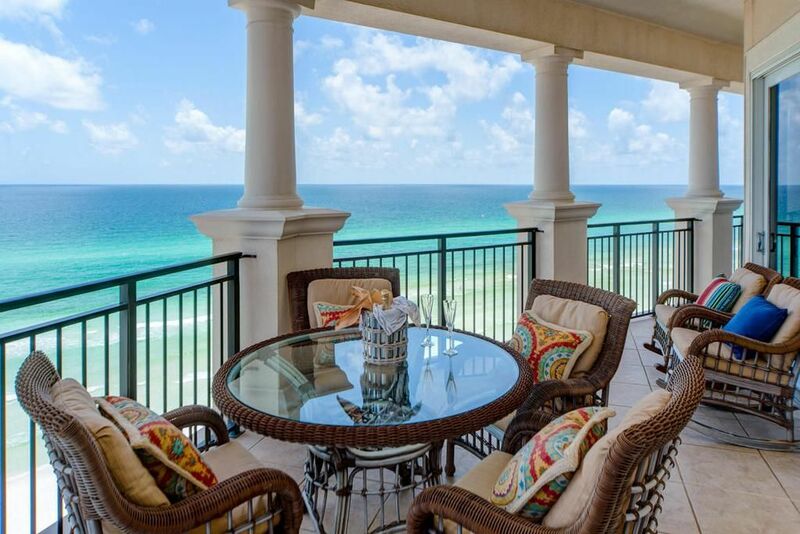 This impressive furnished colonnade that measure 433 square feet is accessible from the main living area and both gulf front Master Suites. The views of the glittering jewel toned waters of the gulf are truly breathtaking and extend as far as the eye can see. The brilliant white beach may also be seen down below as you listen to the soothing sounds of the surf. The large living room is centered on the veranda and includes a gas fireplace, a complete Wet Bar and surround sound for entertainment. The dining room has a soaring tray ceiling with a charming shaded chandelier suspended above the table and a New Orleans inspired antebellum wall mural. 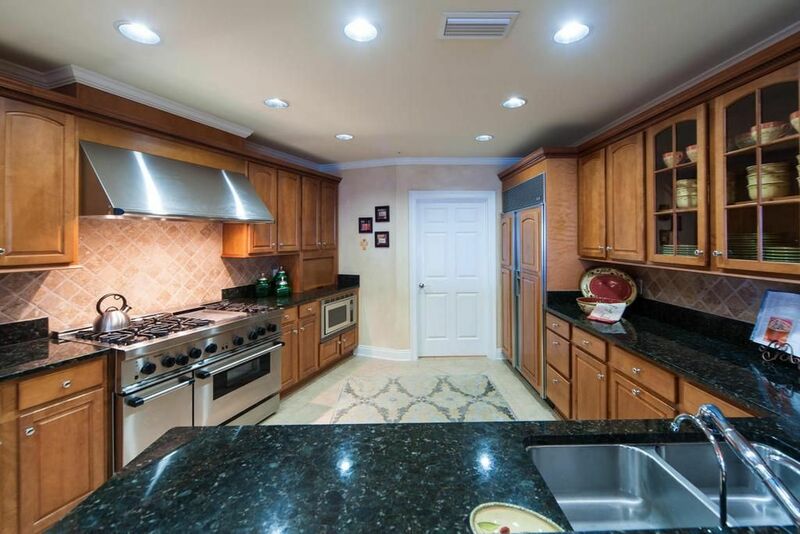 A sparkling dark ebony granite bar with seating faces the state of the arts Gourmet Kitchen that features Lin’s Prestige top of the line appliances, a 48 inch slide in Thermador Oven, a Dacor Microwave and Subzero refrigeration. This fabulous location is in a heavenly world of its own but in the heart of a pastoral picturesque setting that exemplifies the lovely lifestyle along Scenic 30A in South Walton. Restaurants, friendly bars, boutiques, galleries and delightful diversions at seasonal festivals are all just minutes away. This amazing residence at Bella Vita is being offered at $3,100,000. Call our Ocean Reef Real Estate office today for more information and schedule a tour at (877) 392-6085. UPDATE: 56 Blue Mountain Rd A401 recently sold for $2,900,000. 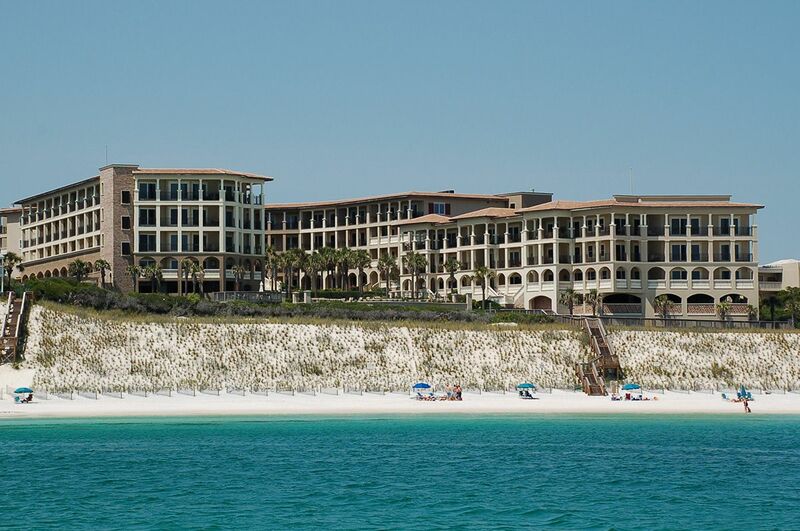 Contact us now to learn more about similar South Walton condominiums for sale.